Republicans and Democrats in Congress have more in common than they like to admit. There is more pretense of difference than actual divergence of ideology between the two parties. Both bend to the will of the ruling class, both support American interventions abroad, both promote austerity and are ready to cut what remains of the safety net. Republicans may agitate against raising the minimum wage, but despite all talk to the contrary, Democrats didn’t raise it either when they had control of the White House and Congress in 2009 and 2010. Both parties are also controlled by the Israel lobby, one of the most powerful in the country. Israel and its allies exercise control over politicians with the power of fundraising. Dissenters from Zionist orthodoxy may face well funded opponents and find themselves out of office. That simple fact explains much that seems inexplicable about recent events in this country. 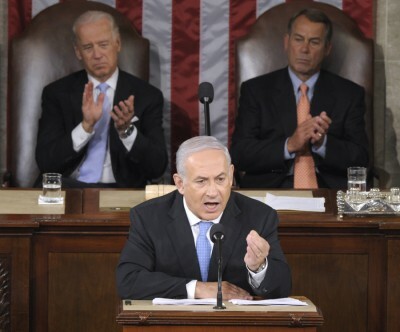 It is true that Republicans invited Prime Minister Netanyahu to address Congress but in the end most Democrats groveled before him just like their leader Barack Obama did. The Netanyahu speech was a spectacular piece of theater and was soon followed by another when 47 Republican senators sent an open letterto the Iranian government. The goal of the missive was to scuttle nuclear energy negotiations between Iran and the P5 +1 group, the five permanent members of the United Nations Security Council and Germany. The Republicans looked ham fisted and are easily mocked. Yet it is important to remember that they would never have attempted to commit such mischief if they didn’t have the possibility of Democratic help. The negotiations are not bound by a treaty and as such do not need congressional approval. However if the 54 Republicans in the Senate can get 13 Democrats to join them they would have a veto proof majority in any effort to limit the president’s authority. To date, 15 Democrats have at various times expressed a willingness to go along with the Republicans and end any chance for negotiations with Iran. It isn’t hard to sneer at the amateurish senator Tom Cotton and his cohorts but more difficult to see through the soap opera and the Democrats who have already declared themselves ready to kill this process too. Republicans and Democrats all follow the lines drawn by AIPAC and other pro-Israel power brokers in Washington. This most recent letter was not the first of its kind. There have been others written by both Democrats and Republicans which exhorted the president not to engage in negotiations with Iran. The worthlessness of the Democratic Party and its supporters is most evident when Republicans show bad manners. At such moments even progressives use the language of the right wing, condemning Republicans for “strengthening the hard liners” in Iran and other such propagandistic drivel. They call Republicans “traitors” and demand that the seldom used Logan Act be used to prosecute them. It would be amusing if it weren’t so sad. No one is willing to speak the truth and say that the entire process is a sham. For years Democrats have joined Republicans in telling lies about Iran’s nuclear ambitions and covering up the easily provable existence of an Israeli nuclear arsenal. Unlike the secret nuclear power Israel, Iran is a signatory of the Non Proliferation Treaty and has always been willing to prove its peaceful intent. Neither the corporate media nor the two-party duopoly explained these facts and the Democrats suffer because of their complicity. Now that the president wants to make a deal he and his party are stuck with all the lies they told in the past. Both parties are true believers in American imperialism. They differ only in style, not in substance. The Republican strategy of appealing to the yokels in their base is problematic because it lets Democrats off the hook. There is no Democratic equivalent of Tom Cotton, getting facts wrong in an undiplomatic letter to a foreign country and getting sarcastic rebuke in return. But Democrats don’t stand up for peace and justice either. When Israel committed daily atrocities in Gaza every congressional Democrat joined Republicans in voting to approve the war crime. Every Republican outrage produces a rube du jour. The 47 senators will be joined by the Koch Brothers, Russ Limbaugh, and other right wingers who are turned into bogeymen and used to keep passive Democrats within their party line. If they didn’t exist they would have to be invented. Because they exist Democrats get away with doing little or even joining in their plots. As long as Netanyahu and friends can tell Americans what to do there will be some sort of Israeli outrage played out in Washington. There will always be congressional speeches or bizarre letters to foreign governments. One would do well to disbelieve the hype and know that the two parties are too often one and the same, and the letter signed by 47 senators may as well have been signed by 100.